Click here to view current Nursing Management opportunities. At the University of Michigan Health System, part of what we call The Michigan Difference is the confidence and knowledge that comes from our people knowing they are among the “Leaders & Best” in their respective fields. Nowhere in nursing is the quality of leadership more essential than for those who serve in Nurse Management. Our community of nurses is comprised of compassionate and caring individuals, each with their own unique strengths and talents. Our Nurse Managers use developed insight, and decision-making and leadership skills to coordinate and maximize the contributions of our nurses – creating teams of highly-efficient and effective professionals capable of providing the highest quality care. Bring your planning, organizational, staffing and management skills to UMHS as a Nursing Management professional. 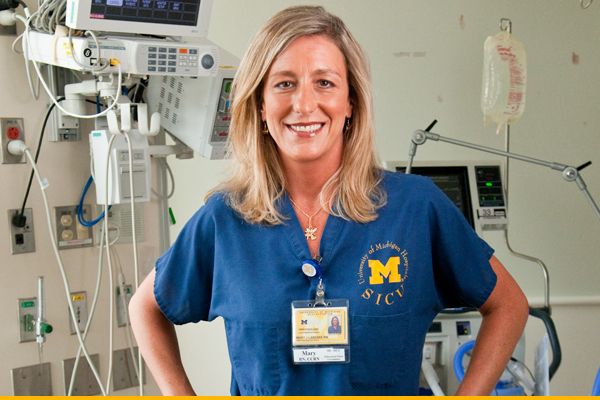 You’ll not only join an unmatched team of individuals who embody The Michigan Difference, but you’ll become part of the incredible future of nursing we continue to create here as well.